I woke up Thursday morning early to get my boys ready to head out of town with my parents and a bolt of panic ran through me as I ran downstairs thinking I spaced the weekend sketch! As my computer was loading, I had to think hard about what day it was.. and whoo hooo, it was Thursday NOT Friday and I didn't space the sketch! Oh summer days..... when you can remember WHAT day it is! TODAY is Friday! TGIF! Are you going to find some time to play along with us this weekend? If you can, check out Laurie's blog for the sketch this week. Thanks Laurie... it's good to have you back babe! Check out the sketch team girls! I used two stamp sets to make this card. The exclusive set from eP called Hangin' Loose with Kona and Sandy Sunsets (one of my all time favorites). 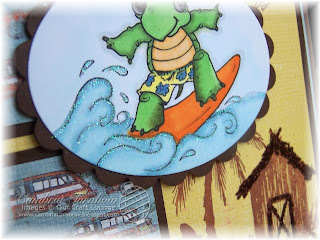 This week, Kisa did a card where she added our Brown Sugar Sparkles to the palm tree and it was SO pretty IRL. So, I copied her and added it to the hut roof and the door. I wish you could see the sparkle! The waves have our Sugar Sparkles on them, but they look really blueish with a tad of aqua. I applied both with a Quikie Glue Pen. The big brads are from American Crafts and I picked them up at my favorite LSS Memories of Time. Have I told you about her brad selection? It's pure heaven. Every time I visit, I come home with new brads! The main image is stamped on Neenah White, the designer paper is Breaking Free from My Mind's Eye. 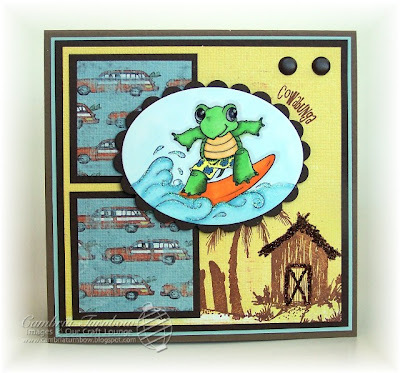 The blue and brown cardstock is from Prism. I used my oval Nesties for the main image. Kona's eyes are raised up with Glossy Accents. I'm leaving for CHA on Sunday, so I won't make next week's sketch. I'm going to be posting fun photos from Florida though! I'm SO excited! If you are going, make sure you stop by the SCS booth! I'm going to be helping Joy with Make and Takes for eP. We'd love to see you and I think you'll love our Make and Take too! There are going to be lots of fun companies hanging out and doing all kinds of fun stuff! Hope to see you! Have a super weekend.... thanks for stopping by! Good Monday Morning! Hope you all had a great weekend. I had a couple more images colored from the weekend sketch. 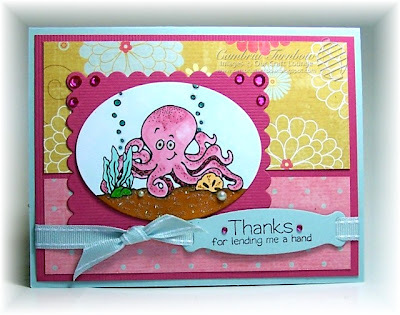 I had SO much fun coloring this cute octopus from the set called Oceans of Fun. Joy always needs samples to send out to retailers she ships to, and Kimberly for the stores she visits. I had the paper cut and the images stamped, so I threw a a few together for them. Last week, when I got my new Copic Colors, I also ordered more Rhinestones and Pearls. I had them all scattered out on my desk... feeling rich with jewels, and decided I needed to add some pearls to the scene! I wish I had asked Marianne to draw a clam shell with it's lid open now..wouldn't that have been perfect to set a pearl in? Ha... maybe next time! My LSS, Memories of Time is bringing in our entire line of Crafty Sparkles. I'm so excited about it. See the weeds? You can't see in the photo, but the shine is AMAZING. It's our Appletini Green Crafty Sparkles. We'll be using Crafty Sparkles in upcoming classes. Kisa and I do one class a month. Check out the store for the dates! We'd love to see you! I love Memories of Time! The girls down there are DA BOMB! Sign up for a class... it's guaranteed fun! Paper: Pretty Please (My Mind's Eye), Soft Sky , Neenah White, Hot Pink Bazzill. Other: Quickie Glue Pen, Appletini Crafty Sparkles, Kaiser Pearls, Kaiser Rhinestones, Glossy Accents, atyou Spica Pens, Brown Sugar Sparkly Fluff, Sakura Clear Glaze Pen, White Brads, Oval Nesties, Labels Four Nesties, Ribbon Tag Trio Nesties, Soft Sky Stitched Ribbon. 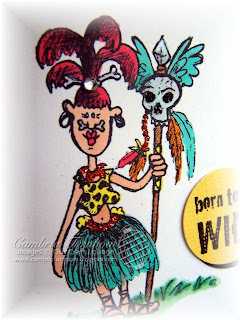 I have this really funky paper from American Crafts called Modabella Bohemian. It's very bright and very busy. To be honest, I didn't much care for it at first. I was determined to use it though. So, I thought how fun to make The Tribe woman all bright and summer like? What do you think? I have two versions... not sure which I like better. I also used our background set called Whispy Patterns. 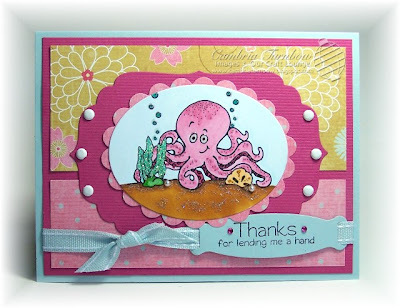 There are all kinds of fun things on her to make this card touchable! Black Eyeliner Sparkly Fluff on the skull eyes and nose. Irish Green Sparkly Fluff on the grass. Our Juicy Orange ultra fine Sparkles on her belt (I'm sure it's not really called a belt... but those beads around her skirt), and on her necklace, as well as on the stick thing. Technical talk I know. *wink*. All applied with my favorite Quickie Glue Pen. This one was my first version. Tell me, which do you like best... if you had to pick? Hope you are having a great weekend. I'm cutting cardstock this weekend and prepping for make and takes. Baylor (0ne of my twins) is going to help me Cuttlebug scalloped circles later today! Love that boy... he totally loves using my Cuttlebug and Nesties! Is that considered child labor? Hmmm... I'll have to think of some payment. Maybe a Blizzard? Thanks for stopping by! Hey stampers! Sorry.... this week zoomed by again! I'm working and stamping a lot, but with things I can't share just yet. I will be back to a more regular bloggin schedule soon... after CHA. I cannot wait to show you our Holiday Release. Can't wait! I did. however, get to play along and play with the weekend sketch. This week, the sketch is by Lori. 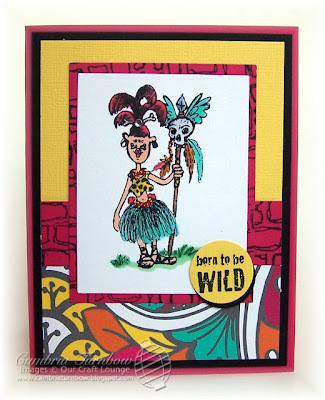 Hop on over to her blog and play along with us if you can! Super fun sketch Lori.. thanks babe! Today, I used the set called Oceans of Fun. The paper is from My Mind's Eye Pretty Please Paper Pack. I used my brand new Copic colors! I LOVE LOVE LOVE those beautiful light colors! I think eP has just a few packs of them left... so if don't have the new colors, you better grab them while you can! I was SO happy when they came... I was jumping up and down... the kids thought I was nuts. I almost kissed the mailman! LOL. Sorry... got sidetracked. 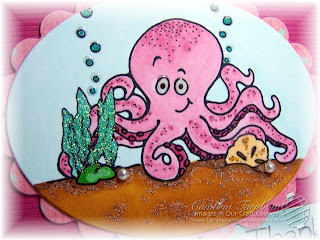 I used Glossy Accents on the octopus eyes, and clear Sakura Glaze pen on the sea weeds and the suctions cups... spots? You know.. those suction thingies on the arms... what are they called? They are fun to touch.. whatever they are called. I used rectangle Scalloped Nestie for the frame, and Oval Nesties for the main image. I added bling with Rhinestones (the latest thing I'm addicted to adding to my cards). LOVE them... and they come in SO many colors. The mailman brought me some more of those too. It was a good mail week... indeed. :) I made that cool ribbon slide tag with the Ribbon Tags Trio Nestablility and my Big Shot. 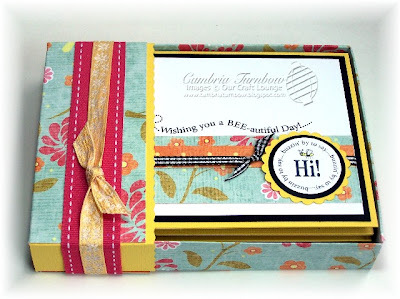 Ribbon is from Stampin'Up! and the cardstock is Bazzill and Neenah. Oh, and I added some shimmer with my atyou Spica Pens. Yikes... I'm not sure if everyone is playing along this week or not, so I'll list everyone just in case. I think Beate will be back soon for good! Thanks so much for stopping by! I hope you have a super weekend! This little box holds six cards with envelopes. 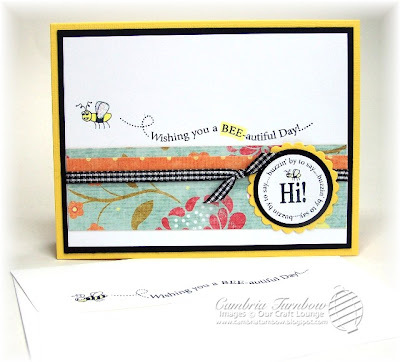 I used the stamp set called Bees Knees, and the designer paper by My Mind's Eye, called Cheery Flowers. The ribbon on the side is retired Ribbon Originals by Stampin'Up! 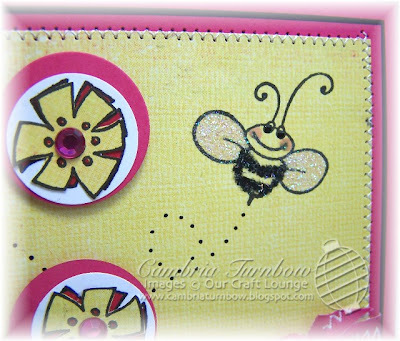 I made the bee wings sparkle by using my all time favorite Quickie Glue Pen and Sugar Sparkles. The ribbon went on perfectly with ZipDry! LOVE that glue! The cards are all simple, but have that extra shazam with the glitter. I really wanted to add a pen with matching designer paper to the side (there is room), but I'm out of pens, so I'll have to do it next time. LOVE this box... Val is BRILLIANT! See her tutorial here. Sorry for being a bad blogger last week, but having the kids home and trying to get my work done is really difficult! I'll try and be better this week. Hope you are having a great summer so far! See you soon, and thanks for stopping by! New Copics Colors Available NOW! TODAY! You can get the new Copic Marker colors today from eP! Look at those beautiful colors! Oh, I NEED them!! (Mine are on the way) I'm so excited I can't stand it!! Click here! Get yours before they are on back order!! 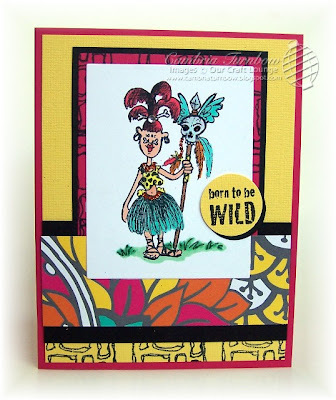 eclectic Paperie is THE PLACE to order these red hot markers. We received a special shipment and are making all 12 new colors available now. Once they are gone, we won't get any back in until September. We've heard that other stores won't have them until end of July. 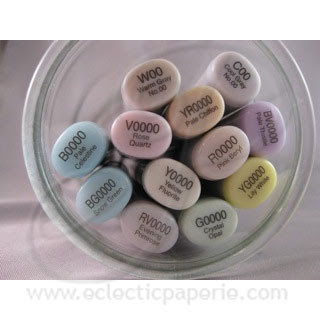 eclectic Paperie is one of the first stores to have received the 12 new Copic Colors, and they are available for purchase today-shipping this week to you. We have complete sets and all 12 colors are also available individually. Copic has come out with 12 new colors. These colors are only available in the Sketch style markers. This brings the new total number of Copic Sketch colors available to a whopping 334 colors! Are you still here? GO.... hurry! I've got new Copics on the way baby!! Have a great day! Thanks for stopping by! (I'll be stalking my mailman this week!) Whooo Hoooo... I can't wait!! Hey peeps! Happy July 4th weekend! I hope you have lots of fun with family and friends and you all stay safe! This weekend's sketch is by Charmaine. 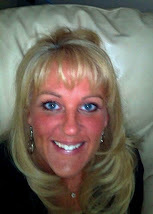 Stop on over to her blog and check it out. I hope you have some time this weekend to play along! I think my center piece ended up a bit bigger than the sketch... I'm blaming the kids. I can't get anything done with them home. Yah, the kids *wink*. 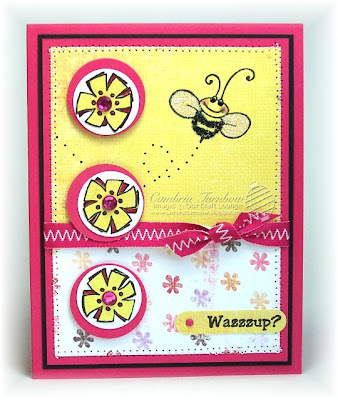 I used the stamp set called Just Bugz (love this set). The bee has Black Eyeliner Sparkly Fluff on his body, and Cosmo Crystal Glitter on his wings. I used my Sakura Quickie Glue Pen to adhere both. Oh man.. guess what the mailman brought me? MORE BLING. I'm SO addicted to those silly little Rhinestone blingie things. I can't help myself... I HAVE to stick them on my cards. The paper is new from My Mind's Eye, the ribbon is from American Crafts, and the tiny little pink brad is from Bazzill. I got them at Memories of Time, here in Coos Bay... oh man, Michelle carries SO many brads. I'm on a mission to own them all. I love brads! The flowers are popped up on Jody's Foam Dots, and I used my Stampin'Up Word Window Punch for the sentiment. Oh, and of course I made those eyes and little dotted trail pop with my Black Sakura Glaze Pen.The cardstock is the new In Color Raspberry one from Stampin'Up! All the coloring is all done with Copic Markers. My parents took all the kids plus friends up to the lake, so I have a day to myself to get some work done, then tomorrow we join everyone for 4th of July celebrations. Hope your weekend is wonderful! Thanks for stoppin' by. Happy 4th!